BOTTOM LINE: An American classic staged in a beautiful historical cemetery with a strange and distracting aesthetic choice. Brooklyn’s Green-Wood Cemetery is, hands down, the most gorgeous cemetery I’ve ever been to. Green-Wood is a 478-acre landscape of lushly-lawned, rolling hills peppered with flower gardens and mature, manicured trees, many of them of decorative species that weep or bend in unexpected and ornamental ways, like oversized bonsai (an odd idea, since bonsai are meant to look like tiny versions of big trees, but it’s the only way I can describe these trees). As if that’s not enough, it also features one of the largest outdoor collections of 19th- and 20th-century statuary in the United States! Walking into the cemetery, you pass through a set of gothic, steeple-topped archways that set the whimsical tone. This place would be profoundly spiritual even if it weren’t for the headstones and monuments marking the final resting places of 560,000 people, including Leonard Bernstein, Boss Tweed, and Jean-Michel Basquiat. In theory, then, using Green-Wood as the venue for a production of Thornton Wilder’s American classic Our Town is a brilliant idea. With Our Town, Wilder tells a tale about an ordinary-as-can-be American town called Grover’s Corners. 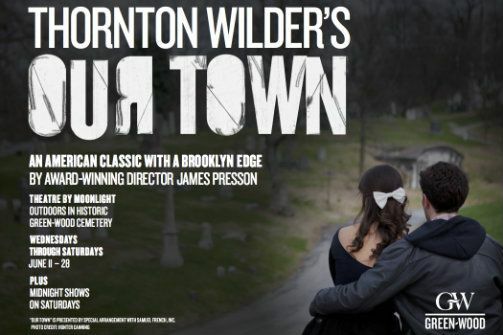 Over the course of three acts Our Town explores the arc of the typical American life at that time, from birth to marriage to death, in a way that is strikingly universal, yet anchored in a story about a specific set of people in a specific time. As I was led up a winding path among a group of other theatre-goers, each turn revealing a new display of crypts, monuments, statues, and headstones, I felt ready to be transported back a century in that way that only theatre can do. Then I was greeted by a group of people, wearing what’s best described as a pop-punk style of clothing (think American Idiot), lounging atop a large crypt. I became a little confused. Perhaps they were going to do something different with this production. Judging from the appearance of the actors, perhaps they were updating Wilder’s play to be about suburban teenagers today. Not a bad idea, I thought, and I adjusted my expectation accordingly. But the confusion about the identity of the play only grew once it started. You see, the pop-punk aesthetic is only surface level and, even there, only partial. Most of the actors wear primarily period clothing (the period being the early 1900s), but with one or two incongruous, modern elements: streaks of bright green in their hair, skull-covered tights under a conservatively long skirt, Doc Martens with flowers all over them, facial piercings, faux-hawks. And, other than the occasional rock song played from a tiny stereo atop a headstone between acts and a few affected movements or body postures that evoked a modern teenager, this aesthetic was entirely superficial and, in the action of the play, played no discernible part except to distract and confuse the audience. If there is a message or concept behind this choice, it is so undeveloped and unexplored that it is ignored in everything beyond the visual. The effect is that it feels like they made the choice, then couldn't afford to go back on it. Like they sort of hoped you wouldn't notice the blatantly-incongruous styles. Like a teenager who wears something bold and daring to school, but hopes nobody points it out. Which is too bad, because Wilder’s play is a simple and beautiful one and nothing more than using this stunningly beautiful cemetery as a venue would have been necessary to bring the audience to its knees--especially in the third act, which explores the experience of death and dying. As is, this production feels like it missed an opportunity; by considering a different approach, without really committing to it, Our Town feels messy and unrealized, high-concept without the substance to back it up. There are certainly some highlights in the cast. Mayaa Boateng is heart wrenching as Mrs. Gibbs, the wife of the abusive town doctor who dreams of seeing the world beyond Grover’s Corners. Ben Diserens is also great as the smily and smarmy Mr. Webb, editor of the town newspaper and father of Emily Webb (Amanda Brooklyn), around whom the story ultimately revolves. The cast is multi-talented too, often caricaturing the townspeople in effective and fleeting moments, playing instruments, or singing beautiful hymns and songs. Jonathan Cottle’s lighting design also deserves praise, as it makes fine use of the cemetery’s intricate landscape. The press release for Our Town states that this production will reflect something “distinctly urban” and give a certain “Brooklyn vibe” to the play. The diversity of the cast accomplishes this, indeed reflecting and celebrating how multi-faceted and multi-cultural Brooklyn is--a great alternative to an all-white cast which, these days, can be a distraction in itself. However, if the pop-punk costume choices are meant to evoke Brooklyn, they missed the mark. I saw much more of the suburban youth of middle America in those tights, hair streaks, and boots--it's the style of the kids who shop at Hot Topic and skateboard in the mall parking lot. Perhaps those kids are the modern equivalent of the burgeoning youth around which the story of Our Town revolves--or perhaps not. That’s not something the play addresses, though it seems to maybe kind of want to. If you think you can ignore this, this production is a great opportunity to spend a few hours in Green-Wood Cemetery. I hate to say it, but that’s the best reason to see Our Town. The real show stealers have been dead for a long, long time.